As published by the Star Tribune. The University of Minnesota’s Weisman Art Museum celebrates its 25th anniversary—marking a milestone in campus museums bridging town-and-gown programming. John Cook looks back at the creation of this architecturally expressive museum. 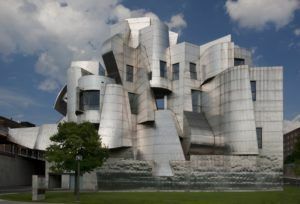 Before there was the Guggenheim Museum Bilbao, Walt Disney Concert Hall or many other billowy, gleaming, world-famous buildings designed by architect Frank Gehry, there was the Frederick R. Weisman Art Museum. At the time, Minnesotans weren’t entirely unfamiliar with Gehry (the Walker Art Center had staged a retrospective of his work in 1986), but the Weisman—with its rippled, metallic facade facing the Mississippi River and its airy, serene galleries—became a talked-about Twin Cities landmark the moment it opened on the University of Minnesota’s Minneapolis campus in 1993. John Cook of HGA was the local executive architect on the original project while at another Twin Cities firm, as well as its 2011 Gehry-designed addition since joining HGA earlier. During a recent stroll through the museum, Cook reminisced on the building’s tight budget, the ins and outs of its famous stainless-steel exterior and the experience of collaborating with the man who is now probably the country’s—if not the planet’s—most famous living architect. Can you describe Gehry’s design process? At the time—I think I was about eight years out of school at that point—I thought that it was a strange way to go about designing a building. But his process was not too far from taking those elements and stacking them to get the right relationships and the right massing with one another. The beginnings are always very primitive. Of course, then he gets into using other mediums, like paper and cardboard. There’s a lot of push and pull. The process is more additive than deductive. Some people would say, “This is a block that’s carved,” but really, it’s a block that has things added to it. How did that curvaceous, Cubist facade come about? At one point, it was very straightforward: a grid, with windows, offices, a lobby, a perch. But then he began to talk about how the views of the river are really important, and that it’s not necessarily the views straight across, but downriver and upriver. That’s when he started to fold the facade, almost like a curtain. This was a big beginning for him in shaping sheet metal into something much more expressive than anything he had ever done in the past. 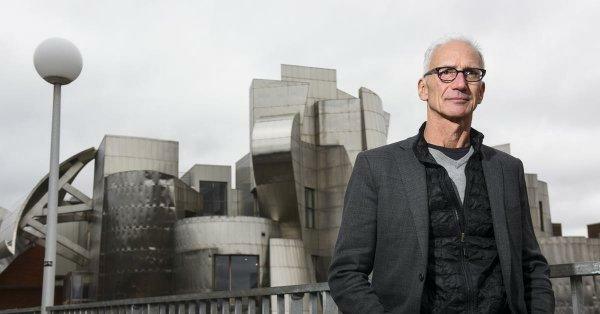 He won Bilbao sometime during the [Weisman] design process. What’s unique about Bilbao is that one of those curvy shapes is about the same size as this entire facade. When the scale got bigger, he felt more comfortable making big, sweeping moves, rather than a lot of these smaller, articulated moves. [Weisman] is kind of a mad scientist studying how different geometric shapes can fit together and still become a piece of architecture. Bilbao is more of an expressive, large-scale expression of structure. Was there ever a what-the-heck moment? The original museum had something like a $14 million construction budget. Was that tight? Yes. This was 40,000 square feet, plus 40,000 square feet of parking. Compare that to the  addition, which is 10,000 square feet, and also $14 million. What’s the origin of the notable brick and stainless-steel exterior? The brick is Frank’s response to the University of Minnesota’s traditional red brick. We had a meeting in our office in downtown Minneapolis, and when we walked out for lunch, there was an old warehouse building with this reddish-orange-y brick, and Frank goes, “I want this brick, this is what I have in mind.” We kind of convinced the university that it was red enough. We didn’t want to defer to what was already here, we wanted to make it a little bit special. Frank had been using metal on some other projects, sandblasted to give it more of a dull finish. He wasn’t comfortable with it being that shiny. We put a mock-up out at Coffman Plaza for the winter, and it started to rust; there was corrosion building up. We did some research and found that if we changed the type of stainless—using a higher chromium content—it was less likely to corrode, but that we had to get rid of the sandblasting finish, because the blast medium we were using had a contaminant in it. They were tiny iron particles that would stay embedded in the stainless, and they would rust. That’s why we got away from the sandblasted look altogether, and did a brushed finish instead. Read the complete Q&A with John Cook in the Star Tribune.